Our first year of homesteading is coming to a close as the end of the year approaches. Before blankets of snow tuck everyone and everything in for the winter, we want to celebrate our first year with neighbors, family, and friends. What better way to do that than by sharing our homestead with you? 9 AM Goat Milking Demonstration: We'll hold off on our morning dairy goat milking until 9 am. Ruby and Jane will take the milk stands first. Followed by Leah and Rachel. Get a first hand view of how to milk a goat doe from start to finish. We'll share how everything from washing our does udders to straining the milk. Try your hand at milking if you want to. 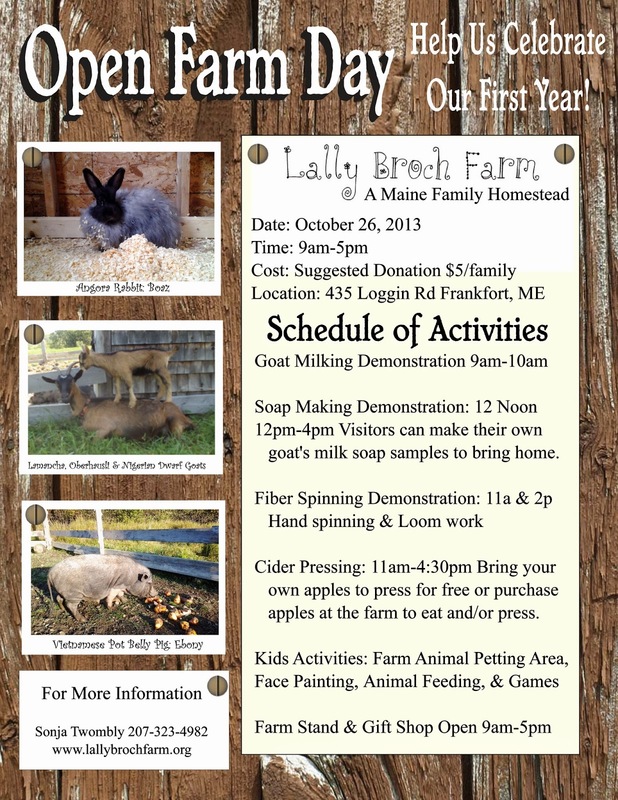 12 NOON Goat's Milk Soap Demonstration: Join Sonja in the kitchen for a live demonstration of making a basic goat's milk soap recipe. 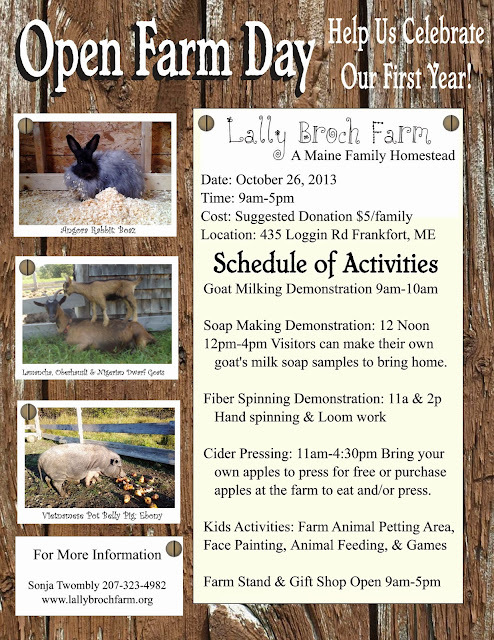 Our Lally Broch Farm Goat's Milk Soap needs to cure for 4-6 weeks to complete the saponification process. But, don't worry! Sonja prepared for your visit by making some unscented goat's milk soap in advance. From noon to 4 pm, visitors can melt the pre-made soap, add their favorite essential oil combination, and bring home a 1.5 oz soap sample of their very own creation. 11 AM & 2 PM Fiber Demonstration: Join local "Treadle and Threads" fiber artist, Kelli Bucklin in a live fiber spinning demonstration. She'll show you how to clean, card and spin fleece. If time allows, Kelli will set up her spinning wheel and weaving loom and demonstrate how they work. 11 AM- 4:30 PM Cider Pressing: Bring your apples and your own containers to our homestead and use our hand-cranked cider press to make up to 2 gallons of apple cider for free. Or, if you prefer, you can purchase apples from local orchards from us to eat or press into cider for a small fee. Petting Area and Farm Animal Viewing: Kids may be able to pet young chicks, ducklings, and goat kids in our petting area. They can visit the pastures to see our retired Quarter Horse, Jasmine and friendly goat does browsing. This is rutting season, so though our bucks are friendly, touching them would not be a good experience! But, you can certainly watch them in their pasture, climbing on logs, head-butting, and maybe you'll even catch them trying to convince a doe that they are irresistible! Watch the turkeys in their yard. Throw some bread or scratch to the chickens, ducks, and geese. Check out the new Guinea fowl. Visit Ebony, our Vietnamese Pot-belly Piggy. And, be sure to stop by to see our the bunnies in the barn. Games: Try to catch an apple suspended on a string. Play a game of bean bag toss. Farm Stand and Gift Shop Open 9 am - 5 pm. We strongly recommend rubber boots or comfortable shoes and warm clothes for your visit. This is a homestead with farm animals. As cute as farm animals can be, animals poop... a lot... unexpectedly. Please, keep this in mind. Also, though we anticipate your visit will be full of great memories for you, farming and homesteads carry inherent risk. Animals, even "friendly" ones can injure people and carry germs. By visiting our farm/homestead, you are assuming those risks 100% for yourself and those you bring with you. We are very excited about sharing our homestead with you. This is our first year and there is so much to do before this homestead becomes the farm Sean and I are dreaming of, but this is a celebration of where we are and what has been accomplished this year. Sonja and Sean--Oooh! This sounds so exciting! I SO wish I were not 1,000 miles away. Have fun! Goaties, Keets, & Ducks... Oh My!